This is the name a woman at work used to describe the caramel stuffed brownies I brought to school today. Of course every woman knows that chocolate is the cure for many common maladies. The addition of caramel, pecans and chocolate chips…well that could pretty much cure anything. Ok, so maybe not anything, but they will definitely cure your need for something sweet. Rebecca Rather of Rather Sweet Bakery has done it again. I haven’t made anything from her cookbook, The Pastry Queen, that hasn’t received praise and adoration from those who have been lucky enough to indulge in their sugary, buttery goodness. I cut these brownies into about 1 inch squares and they were plenty rich and satisfying. If they were any bigger you’d need a tall cold glass of milk as an accompaniment. Ben could barely choke down one of them without going into a sugar coma. The texture if very fudgy. 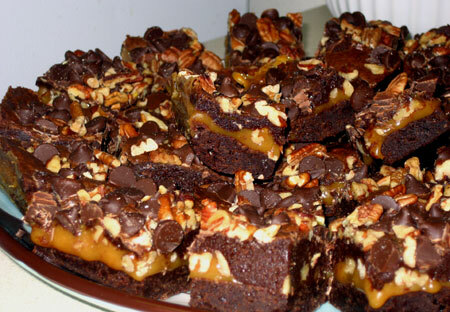 The caramel in the center is creamy and it oozes out the sides of the brownie like a glorious sugary waterfall. The pecans and chocolate chips create a balance of texture that makes them irresistible. I poured half of the batter into a foil lined and very well greased pan and baked it first. Here is my first layer fresh from the oven. The hardest part of the recipe is spreading the top brownie layer on top of the caramel. You can tell from this picture that when I spread the brownie layer over the caramel I didn’t do the best job of spreading, so some of the caramel mixed with the brownie. I don’t think it made a huge difference though, so don’t go crazy when you get to that step, it’s not a life or death kind of baking issue. 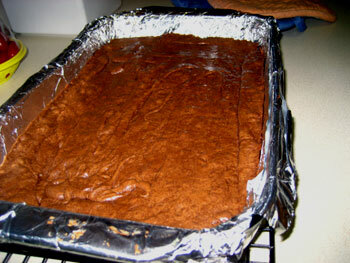 After baking I chilled the brownies in the pan overnight and cut them as soon as I took them out of the fridge. Even in the 10 minutes that it took me to cut them I noticed the caramel start to soften and come out of the sides of the brownie, so if they hadn’t been cold I’m sure I would have had a pretty nice mess on my hands! Here is the recipe from The Pastry Queen cookbook. These are a real treat, decadent and delicious. With the weather cooling off, these are a good fall and winter dessert. Preheat oven to 350 degrees. Arrange pecans on a baking sheet in a single layer and toast until a rich brown, 7 to 9 minutes. Coarsely chop nuts and set aside. Line bottom and sides of a 9- by 13-inch baking pan with aluminum foil, leaving several inches hanging over short ends of pan. Grease foil with butter or cooking spray; be sure to coat sides thoroughly or caramel will stick. Put butter and chocolate in a medium-sized heavy saucepan and cook over low heat, stirring occasionally, until melted and smooth. (Watch carefully so it does not burn.) Transfer chocolate to a large bowl, add sugar, eggs, and vanilla, and mix until thick and glossy. (This takes 1 to 2 minutes using a wire whisk or about 1 minute using a mixer fitted with a paddle attachment on medium-high speed.) Whisk or stir in flour and salt. Transfer half of batter (about 2 cups) to baking pan and spread evenly; bake for 20 minutes. Let cool for about 20 minutes. Put caramels and cream in a medium-sized heavy saucepan and stir over low heat until melted and smooth. Remove from heat and stir in half of pecans. 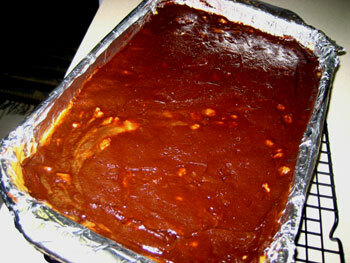 Immediately spread caramel mixture over baked brownies (if you let it sit, it will harden). Pour remaining brownie batter evenly over caramel mixture and spread gently to cover (do not pour either the caramel or the brownie batter all in one place or it will be difficult to spread without messing up the layers). Sprinkle chocolate chips and remaining pecans on top and bake for 20 minutes. Cool completely in pan (for quicker cooling, put pan in the freezer for 30 minutes). To remove from pan, grasp overhanging foil and lift up. Cut brownies into squares. Individually wrapped in plastic, they will keep for 1 week unrefrigerated or for 1 month in the freezer. Makes 2 dozen bars. ABSOLUTELY WONDERFUL little treats! To all you Hottie Biscotti blog readers…these little treats brightened everyone’s day at the school and had us beggin’ for more!